There is a real mixed bag of matches scheduled to be played this Saturday with many of the cup ties being re-scheduled after being cancelled due to the adverse winter weather. Lochar Thistle take on Stranraer in the second round of the Souths most prestigious Cup competition, the Challenge Cup at Maxwelltown High School while Upper Annandale play Queen of the South at Moffat. Both Senior teams are expected to win their respective contests to make it through to the third round although the South teams will as usual give it everything they have to upset the odds. 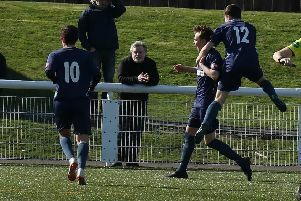 Abbey Vale play hosts to Dumfries YMCA for the second week in succession, this time in the first round of the Potts Cup and it would be a surprise if Vale did not once again overcome a plucky YM side to progress in this particular competition. Creetown entertain Fleet Star at Castle Cary Park in the same competition for a match that could well be very even although with home advantage favouring Creetown they will start as slight favourites to make it through to round two. Wigtown and Bladnoch play Crichton at Trammondford Park in another match that looks like it could go close and one that could well take more than the regulation ninety minutes to produce a winner. Heston Rovers and league leaders Edusport Academy meet at Palmerston Park in the second round of the Tweedie Cup for a match that the visitors look like slight favourites to progress from although much depends on the playing personnel available to Edu for each match. Heston though are not an easy team to beat especially on their home pitch and are more than capable of causing an upset. There are also two South of Scotland League matches being played with Nithsdale Wanderers playing hosts to Mid-Annandale at Sanquhar for a contest the Lockerbie side could well take the three points from while St Cuthbert Wanderers entertain Newton Stewart at Kirkcudbright following their three goals to one cup win at Blairmount last Saturday. Saints will go into this match as favourites to take the points but the Creesiders are expected to give as good as they get and the result could be close at the end of the match.